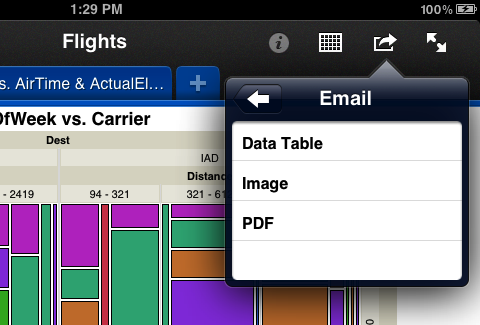 Yesterday I posted about the different ways to move your JMP data table from your desktop to your iPad, so you can use it with JMP Graph Builder for iPad. Once you've done that, you'll most likely want to share your discoveries with other people. Sharing is one of those virtues that's considered generally good for humanity, so I think it's worthwhile to spend a little time listing all the ways you can share your Graph Builder results. I'll start by stating the obvious because sometimes it gets overlooked. But if you have an iPad 2 or the latest 3rd-generation iPad, you can simply plug a video adapter into your dock connector and project the iPad screen onto a big screen for all to see. If you carry your iPad to meetings, just plug it into the projector that's probably already in your conference room. Now it's super easy to collaborate with your colleagues and analyze your data live. 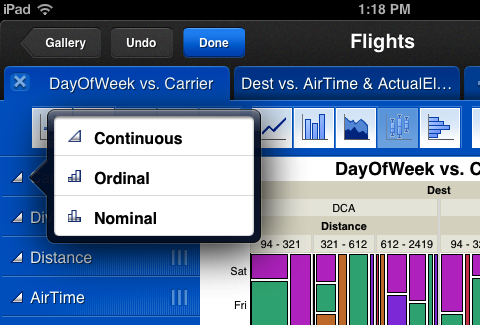 Or if you're in the classroom, show your students directly how to find outliers or compare means. All you need is an adapter — Apple sells flavors for HDMI, VGA, and Composite video. By the way, Graph Builder looks stunning on the new iPad. Graphs are drawn at full resolution, which makes lines and markers look incredibly crisp. In Part 1, I described how to move your data table to the iPad via iTunes. Well, you can use that same process in reverse, to sync changes to your data table back to your desktop. First, tap the icon (we call it "Share"), then choose "Send to iTunes". You get a message confirming that your data table was "copied to the iTunes folder," whatever that means. What it means is that your data table was copied to a location on your iPad where iTunes will sync it back to your desktop. Once you plug up, click the "Sync" button in iTunes and the data table gets transferred. You can now drag it out of the Graph Builder Documents list to finish the reversal of yesterday's process. This is useful if the data came to you from some initial source other than iTunes, like from email or a Web page. You might want a copy of that table back on your desktop, and this method will do the job. But if the data came from your desktop through iTunes to start with, is there any point to sending it back? Since you can't actually edit the values on the iPad, what would have changed? It turns out that if you create new graphs in Graph Builder on your iPad, then those graphs are saved within the data table as table scripts. If you send the table back to iTunes, you'll notice the new scripts. You can even run them in JMP and reproduce the same graphs you created on the iPad. Pretty cool! Also — and this is a bit geeky — if you change a column's measurement type, by tapping its icon next to the column name while in Edit mode and picking a value of Continuous, Ordinal, or Nominal that is different from the current setting, that change gets sent back too. Just as you can open a data table attached to an email message in Graph Builder, you can also send a data table to others through email. Tap the Share icon, and this time choose Email. Now you have a choice: You can choose to attach your data table to an email, or you can send a snapshot of the graph you're viewing. And that graph can be sent in two ways: as an image or as a PDF. Emailing the data table doesn't need an explanation. But if you just want to send a graph, how do you choose between Image and PDF? It depends on whom you're mailing it to. If your recipient is a Mac user, then PDF is probably the best choice. That sends them a beautiful image that they can scale up or down, and it still looks great. Windows users can deal with PDF, but they might prefer Image, which sends a PNG file with a fixed resolution. Windows email also makes a distinction between an attachment and an inline image — a distinction not made on the iPad or the Mac. Usually, Windows users will see your graph as an attachment: a file within the email that they have to open with another program to view. But if you send the email as "rich text" and you attach an Image, it shows up "inline" within the body of your message. To send the message as rich text, just apply a bit of formatting. Make a word bold or italic. It's even sufficient to "change" the text color to black. If you need a hard-copy printout, you can create it directly from Graph Builder. 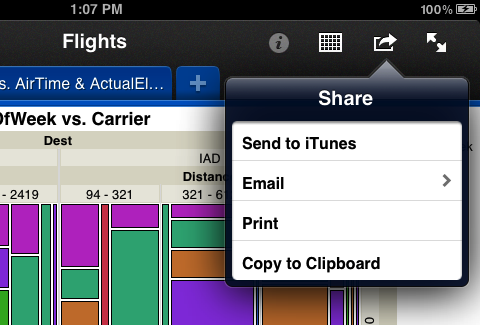 The "Print" option on the Share menu lets you send your graph to an AirPrint printer. Finding such a printer might be the hard part! The final option on the Share menu — "Copy to Clipboard" — is the first half of the familiar Copy-and-Paste paradigm. Tap "Copy to Clipboard" in Graph Builder; then switch to Pages, Keynote, or some other iPad app and Paste. Your graph gets inserted into that app's document. Pretty simple. So in conclusion, Graph Builder is a good iPad citizen that plays well with others. Get familiar with these techniques and share your discoveries with all your friends!